It didn’t take long to figure out that people don’t actually disappear into the abyss. Perhaps my research needed to be more thorough. Had I really researched all of my sources? Two commonly forgotten sources are prison records and mental health facility records. I’ve always heard of poor Great-Aunt Hattie and her mental unrest, and I remember dear Grandma Maggie who died in the Larned State Hospital (KS), a psychiatric facility, but what about the others who can’t be accounted for using normal means? There was the case of 3rd Great-Uncle Willis Cox and his daughter Freddie Reba (Cox) Looney. (I’m not making up that surname). They both disappeared about the same time. Last noted, Willis was living in the Coffeyville, Kansas area and Freddie Reba had left husband number two (Jake Looney) and was living in Washington County, Oklahoma, close to the Kansas border. Both Willis and daughter Freddie Reba dropped off the radar between 1910 - 1920. By running a quick check with the state hospitals, both were found as patients in the Osawatomie State Hospital. Yes, coincidental (or disadvantaged gene pool), but they were both there. The biggest issue was not in locating them, but trying to pull their medical records. Osawatomie will not share, or do not own, the patient’s files. 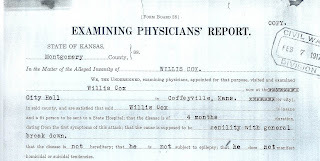 However, as luck would have it, Willis Cox’s medical records from the State Hospital were complete with his Civil War Pension records. In the survey for family medical history, a bit of information from the attending physicians was also provided about Freddie Reba’s stay. I suggest as you expand your research for that missing ancestor, you go a little mental! 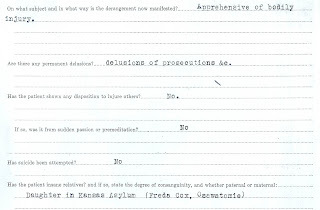 You might check with the Kansas State Historical Society -- I know that they have patient records from the Topeka State Hospital. I'm not sure about other Kansas asylums. I am searching for info./records for my great-grandmother Amaranth Kelly Watkins. She was an "inmate" at Larned State Hospital. I've found the roster upon which she is listed, but no further info. I am plowing through Kansas State Historical Society site, but no luck as yet. With the backward attitude towards mental health issues in the 30's-50's, her presumed time there, everything was very hush, hush within the family. I have one relative in particular that was institutionalized and have had a terrible time getting a hold of the records. Our "family wing" was at Clarinda, Iowa. Thank you for a very useful and insightful post... good information and reminders. I had a great Aunt that was in Clarinda State Hospital from 1930-1940. How do I find more info on that as to why she was there? I'd love to know her story. State Historical Societies and other repositories do have archived records if they were submitted by the institution. My mother, Betty Joyce Ward Smith, died at Osawatomie State Hospital. (1956.) She had been admitted for schizophrenia. Family lore says that she was given shock treatments, and that caused a pulmonary embolism, which killed her. The family was so "shocked"
Thanks for stopping by and posting. Unfortunately, this was more common than one would think. I'm sorry to hear that you and your family went through this. And, yes, the real "shock" is usually to the family left behind. I found this site with a google search because I have more than one relative that I believe spent time at the Osawatatomie State Hospital. Is there any way for me to find out? I am looking for a relative (my deceased father's adoptive) mother, who I just found out was at Osawatatomie State Hospital. We were always told she had died. I know she was still there in 1961 and most likely had been there 20 yrs. Her name was Esther Larson. How can I find out any more information? Thanks! In the state of Kansas, many records are held at Osawatomie are closed and not detailed. There is an index. But since you already know she was there, you can also request a state death certificate, funeral records may also have details on her death or stay at Osawatomie. You will need to do a full search however, since there are several Esther Larson's in Kansas (Hutchinson, Salina, etc). Hi, I just learned (via 1940 census) that my great-grandmother was in Osawatomie. I do not know how long she was there or when she died. How can I access the index? Is it by year? Thank you in advance for any information you can provide. Kakers(? )Have you ordered a death certificate from the state of Oklahoma yet? Death certificates will give quite a bit of information on burial location/funeral information etc. and if she died in the mental hospital, it will also list it. There were several papers in that area for the 1920's: Enid, Fairview, Cherokee, etc. If she was from that area, her family may have placed an obituary/announcement in the paper. If she owned land, you may also check probate records at the county court. Thank you for posting this - I have a great-grandmother that died in the Nevada State Hopital in Nevada, Missouri - I have found very little records on her and to this day have not found out where they buried her in Dixon, Missouri. You can get her death certificate free online if her death was between 1910 and 1964. I learned this researching my brother-in-law's family just this last weekend. It's not limited to only the hospital deaths. It's statewide. Go to Nevada State Hospital site and scroll down.